This week, I decided to organize my scarf collection. As I looked down the rainbow of silk stretching across the living room floor, I couldn’t help think about some of the discussion we had last week when I wrote about 100 things for your wardrobe. In the comments, many of you said that 100 items seemed excessive. Looking at my closet, and particularly my collection of scarves, I have to admit I felt a bit ashamed. You see, I agree with those of you that believe in simplicity. The fact is, most of us reading this live in a highly consumerist society. We’re inundated with constant messages to buy, which I personally believe are unhealthy both for ourselves and for the planet we live on. To a large degree, they distract us from more important values, like family, community, education, creative life, and giving. Shopping is fun, but it’s like a drug. It promises happiness, but can never deliver on that promise. At most, it’s a short, fleeting pleasure. I’d like to say that recognizing these simple facts makes me immune to the siren song of accumulation. The fact is, I like pretty things. Take my scarves, for instance. When some of you said you don’t own 100 items of clothing, I felt like blushing because I probably own 20 or 30 scarves alone. I like them because they’re colorful and cheery. I wear them with almost anything. They keep me warm in the rather chilly climate I live in. They remind me of my grandmother. Vintage ones are easy to find and very inexpensive (I usually pay a few dollars). They’re just so easy to collect! They seem like the definition of harmless fun. But do I need all these scarves? Or all my vintage costume jewelry? Or all the shoes I own? I think the problem isn’t so much that these cost a lot in money or time or energy, because they don’t. It’s more the mindset of accumulation, of feeling that having more is better. The fact is, despite the fact that I know that this is all just “stuff,” I’m attached to it. I have to force myself to clean out my closets, and it’s very hard for me to part with things. Sometimes I wonder if we humans don’t suffer from some primitive hoarding instinct that, in our modern society, has been misplaced onto things like gadgets, clothes, makeup. How else to explain the fact that I resist throwing out a single scarf, even if I never wear it and it’s completely threadbare? In theory, it seems the key is moderation. Enjoy your things, but don’t let them rule your life. Allow yourself some extravagances, but don’t spend all your energy thinking about them. Have fun, but be willing to let go. But this is easier said than done. How do you know when you’ve crossed the line? How much is too much? 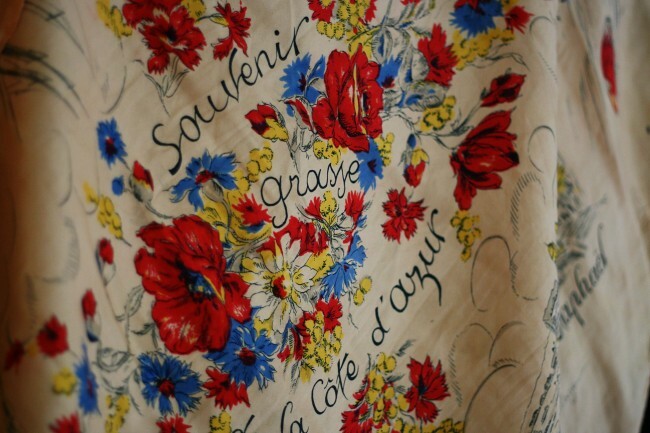 By the way, I am particularly fond of vintage souvenir scarves, like this one. I can’t pass them up if they’re pretty. A very thoughtful and intelligent post. 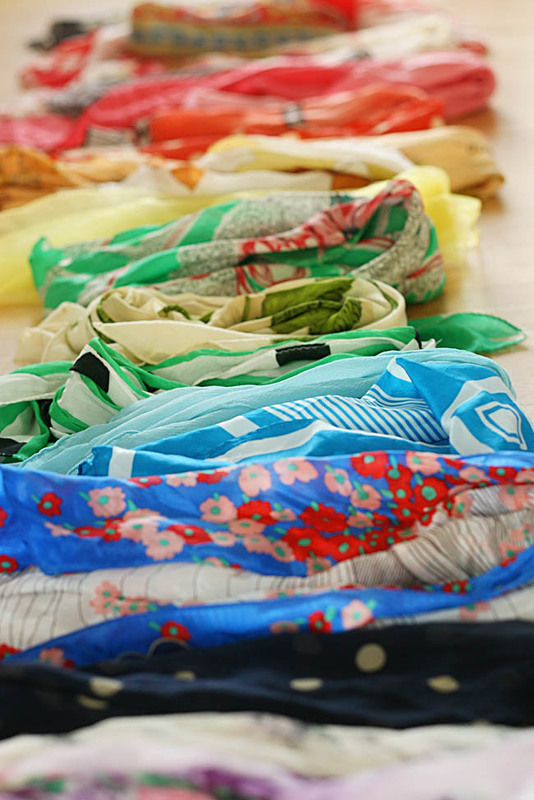 When you see these beautiful photos of the scarves – oh, how could someone resist them?! Yes, it’s not just all about accumulation, it’s about something on a much deeper sensory level. I’d feel really sad to think I could never buy myself another vintage cocktail ring – and, as you say, I don’t really spend that much on these things. Everything in moderation – that’s what my grandma used to say. Not sure I have supplied any answers here! I think if you are actually wearing your scarves, then I say the more the merrier! I’m more worried about my 5-6 that I never wear than your 20-30 that are well loved! lol. I’ve seen some people frame vintage scarves and use them as art, so that could be a productive way to enjoy some scarves that, for whatever reason, you never seem to wear. I probably have more than 100 things (if we’re counting scarves/belts/etc) but I’m more satisfied with what I do have. I’ve tried to impose a rule of “I have to absolutely love it to buy it,” and that works well for me. I seem to have an easier time not buying things in the first place, as opposed to actually getting rid of them once I do have them. I recently counted the contents of my tights drawer. I have nearly 50 pairs; I was horrified! But, very few of them are black opaques or ‘flesh’-tone low-denier basics. Most of them are coloured or textured or patterned or lacy. Wearing a different pair of tights with an outfit can transform it – I think the same goes for scarves – and since I have a relatively small wardrobe otherwise, this wide choice of legwear gives me many more outfits than I would otherwise have on my miniscule budget. I also have something like 50 pairs of tights. ^_^ Other than my tights, I have maybe a dozen basic wardrobe pieces, mostly in solid colors, that I come back to over and over again; tights add pop & variety to my wardrobe that would otherwise be lacking. There’s something about the right pair of tights that makes me feel like I have superpowers (when Sarai posted about red lipstick a few months back, I immediately thought of my tough-as-nails peacock blue tights). Tights are inexpensive, compact, and infinitely useful when they’re no longer suitable as tights: what’s not to love? So funny you should post this the day I decide to use my late grandmother’s (hefty collection of ) sewing scraps to make scarves for myself! To be honest though, I think it’s okay to stock up on accessories if you tend to go a minimal route with clothing, it changes things up a bit! If you wear them everyday then I don’t think it’s too bad, it’s when you buy and don’t wear (in other words, hoard) that it gets worrying! People said they don’t have 100 items? They’re lying! Even everyone owns at least 7 pairs of underwear and 7 pairs of socks and that’s 14 items right there. Plus if you have to switch out for seasons…. I’m lucky (or maybe not) to have a double wardrobe so I can pack in lots of clothes. A season of clothes, for me, usually fits in 3 large plastic bins, not counting outerwear or shoes. The left side of my closet is devoted to costumes and my vintage clothing collection. My big weakness has tended to be wool cloches. I have many of them but now that I don’t have the appropriate haircut with which to wear them, they languish in a corner. My excuse is that I can use them for theatrical costumes, being a costume designer! That’s my excuse for buying any clothes, though. I do not think you could ever have too many pieces of vintage jewelry and accessories. I am not a saver and regret getting rid of a lot of items like that over the years. I was really young when my grandmothers died and never had the chance to inherit any of the great “stuff” I am sure they had. My own mother was not a saver either and I am sure she got rid of all kinds of items that I would have loved to have. I will live vicariously through all of you lovely ladies. I don’t tend to limit myself to second hand things, in fact I would much rather stop 5 pairs of shoes from going into landfill by buying them off Ebay than I would buy a new pair of shoes. Besides jeans, plain t-shirts, underwear (every few years when the old are threadbare!) and the odd plain jumper or cardigan I very rarely purchase clothing from shops, I don’t enjoy it and it’s too expensive. I agree totally with the others that if you’re using them and enjoying them then there’s no reason you shouldn’t buy them. I go through my rather large shoe collection (almost entirely from Ebay at a few £s a pair) a few times a year and give the ones I’m not wearing to the charity shop, the same with clothes, if they’re not being used then off they go to someone else whether I’ve made them myself or not! I’m the same, I really don’t enjoy shopping retail stores (except fabric stores, of course!). I get really overwhelmed in a way that I don’t when I have to hunt for vintage things. This post hits home with me! I’ve struggled with this issue of accumulating more clothing/accessories than I truly need. Thankfully, getting into sewing over the past two years has gradually brought me around to being a lot better at resisting the “consume, consume!” messages thrown at me by advertising and our society in general. Now, I really try to only purchase clothing (preferably vintage or second-hand) items that I truly love and wouldn’t likely sew/make. It can still be very hard to resist those inexpensive, eye-catching, unneeded items, though. Great post. I’ve been struggling with this here lately, too! Only in my case, I don’t accumulate clothing or accessories- for me, it’s books, DVDs, and records. One of my new years goals was to get rid of some of my stuff and to stop accumulating more stuff. So I put myself on a 2 book a month limit and vowed to cut way back on movie purchases. I’ve been weeding through my “collections,” one at a time, trying to force myself to get rid of the records I don’t listen to, the books I’ll never read again, etc. The best thing that’s resulted from this is that I don’t make nearly as many meaningless purchases as I used to. :) I spend a lot more time thinking, Do I really want this? Will I use it? Is it worth it? I hear you. We went through a huge book purge years ago, and every since have been much better about collecting them. I grew up with a lot of books around, and I really like having them around. But it can get to a point where you’re holding onto them for no real reason, or buying them when you really should go to the library, etc. I think it gets to the same thing, though. There’s a certain comfort in this kind of accumulation. I’ve fallen back in love with the whole idea of a library in the last few years. I’m lucky to live in a town that has a fantastic library, packed with really well-selected books on a wide range of topics. It’s ALWAYS packed with readers, and is such a fantastic focal point for our community. In terms of stuff I have almost nothing, since I’ve lived in a very itinerant manner in the last two years. Nearly all my clothes are either self-sewn or hand-me-downs from my boyfriend. I love vintage scarves and costume jewelry — since I inherited a lot of it, I simply could never part with pieces that remind me of my Mother and Great Aunts. I also have 3 granddaughters under the age of 7, so you can imagine how they also love to browse through pretty things. They get to take home favorites from time to time, and they wear them! I wear it too, nothing cost very much, they give much pleasure. I probably won’t buy more of these, but happy to have them. Enjoy yours. When I was little, I always used to play with my grandmother’s scarves and costume jewelry. I still have one or two pieces of hers that I would never ever part with. IF it makes you happy, do it. Think of it this way – you’re helping someone else make a living but buying their stuff. People forget that disposable income is what makes the economy ticks, which is why high gas prices now are really hurting everyone. What was spent in the past on a pretty pair of shoes goes toward filling the gas tank of your car. I have lots of fabric, so what? I’ll sew it all eventually (!!!) or sell some of it. But it hasn’t overtaken my life, so I’m okay with that. As for your scarves, why take a clothesline, tack it across a wall and arrange the scarves by color? I think that would be very striking and pretty. I don’t think we should feel ashamed for liking and wanting to surround ourselves with beautiful things or even in having a collection that we admire. In some ways it is the essence of the spark of creativity to recognize beauty and want to hold it and explore it. I think that buying vintage scarves that you truly appreciate and enjoy is maybe less of an issue than the tendency today to buy cheap, disposable clothing that is not manufactured to be well-made or enjoyed for very long, but rather as a quick and easy fix for some other need or desire that is transfered into the compulsion to “accumulate”. The waste of precious resources and the exploitation of underpaid people is at the heart of this issue, so maybe for each person the question is how much do I personally want to feed that cycle and how much are my possessions really costing in the long run? I know once I went through my wardrobe and actually realized how much of every type of thing I had – I was appalled. In really looking at it all, I found things I didn’t really like much, or that didn’t fit well, or look that good on me. I’ve been on a mission for 9 months now to simplify my consumption and accumulation of clothes by 1) banning shopping for anything I could put on my body (including shoes, accessories, coats, underwear…) and 2) I sew whatever I need/want out of the clothes or fabric I already have on hand. And…it’s been a blast! I’ve even lost my shopping craving! I now see opportunity, possibility, creative challenges everywhere with this change of consciousness. I did the same thing, pao. I did the Wardrobe Refashion challenge a while back and didn’t buy new clothes for a year (secondhand and handmade was fine). It was awesome and completely changed the way I buy (or don’t). Continue to enjoy all your scarves. Truly. They’re beautiful. Your 20 – 30 scarves that you enjoy and wear regularly isn’t the problem. I believe the stuff we buy when we’re stressed, feeling low, and don’t really like but buy anyway as we don’t want to pass up on a good deal, that’s more of a problem. Looking back, I realize how dumb that is. You have too much, when the stuff owns you, instead of the other way around. If you love your scarves, have a place to keep them and enjoy them, it’s not too much. When the stuff gets to the point where you don’t remember what you have, don’t use it, don’t have room or time to keep it organized, and can’t enjoy it, then you have too much. I really really like this idea, Janie. I think this is a really good discussion! And it’s good to think about for all of us. I really agree that a lot of it is what feels comfortable to -you-. I love to collect things, but I’m not afraid to do occasional purgings, either, and know that it’s ok to say good-bye to things (this was learned after feeling like we’d collected a bit TOO much of good things several years ago, and we reigned ourselves in). Be it a skirt I thought I’d wear but 9 months later still haven’t, or going through DVDs, books or vintage knick knacks. In my wardrobe, I try to keep it to what I really like and what I wear, and periodically do a check once a year or so to see if I’m getting excessive with stuff I don’t really wear or use. There is nothing wrong with you having 20-30 scarves that you love and wear a lot…and okay, there are probably a few you don’t wear that much, but that’s hardly the end of the world (and goof grief, scarves are so small anyway). :) So long as you’re not just blindly purchasing for the sake of that temporary ‘high’, which by no means it sounds like you are doing. So I don’t really think of that as feeding into consumerism. If someone has 30 dresses they never wear, then perhaps it’s time to do a little cleaning out. For me, it feels better having my wardrobe space for the things I love and wear than things I just think I’ll love but then never wear. I do feel like I probably have more shoes than I should, but I’ve gotten rid of all the ones I don’t really wear at this point, so I feel comfortable with the ones I have, even if I know it’s probably a bit excessive. And I try not to mindlessly purchase new ones without thinking about the gap they may fill (I do not need more brown shoes!). I think it’s more problematic when the amount of your wardrobe feels unmanageable, or you absolutely cannot let go of things even if you don’t use them or need them, or your closet is stuffed full of clothes with the tags still on them, or you don’t know what you have, or you’re shopping and acquiring possessions because you feel pressured to compete with others. That feels more unhealthy to me, personally. I agree with everything you said, Tasha. For me personally, I think I just need to be more disciplined with the stuff I don’t love, to learn where that line is between hoarding and collecting. Then I wouldfeel more secure in holding onto the collections like this that I do truly love. I think what we own and how much is as much about personal style as the colors we chose and the fit and style of our clothing. I am not a collector or hoarder by any means. I like things simple because I am a bit lazy about getting dressed . .. I want few choices so I can make a quick decision for the day based on weather and daily activities. On the other hand I have family members that are definitely collectors . .. my mother owns 3 tubs of turtle necks! “You never know when you need a certain color” she tells me. But, you know when I visit her she gets dressed just as fast as me. My mother likes her clothing to make a statement about her. I like clothing that fades into the background because I want to be the statement. Enjoy your scarves and your clothes and shoes. Be mindful when you shop from here on in. I’ve noticed that as we get older (and I’m nearing 60), we naturally begin to give things away or get rid of things in yard sale. I realized this a little while ago when I noticed how easy it was to give away things I used to cling to, so I started doing a little research and so far my theory is holding: that is, we spend the first half of our lives accumulating stuff, and the second half paring it down. So, go guiltless into that thrift shop and fabric store! Interesting theory, Colleen! I know I’ve received some amazing gifts from my grandmother when she does purges. She just gave me a ton of gorgeous quilt blocks she made years ago. Anyway, I can definitely see this being true. What a lovely collection of scarves! I can see why you would not want to part with them. I have more than 100 items but I am learning to make or buy things I love and donate things I bought when I didn’t know how to so or didn’t have the money for the items I really wanted. I have also learned after staring into a close of things that I hated – that it is better to buy one new thing you love and can’t live with out, then 5 items for the sake of lots of new clothes to wear. When I was younger I would buy 4 or 5 pieces on sale that coordinated and were suitable for work, but were not necessarily my style or thinks I really liked. They were just clothes I figured could get me through the day. As a result I ended up not wearing them very long before they felt old or wore down and as a result ended up at the back of the closet while I went to get a few more cheap items. I think some times the ideas of spending less money and doing more with less can have negative effects, because I seriously felt I was doing more with less and just getting by. Now, I add garments I love which may be more expensive then $20 blouses at Marshalls, but I know I will keep and wear them longer. I don’t know if I will ever get down to 100, but I know my closet will never be packed with items that I don’t even want to wear again. To me it isn’t having too many clothes that would be wasteful and shameful it would be never wearing/enjoying them. Your last sentence… so true! I agree about buying more expensive things but perhaps fewer of them. Though I do have a hard time justifying large purchases for myself. i love this post, so many things to think about… but in the end, if your scarf habit makes you happy, i don’t think you’re crossing the line. looking at that first picture made me incredibly happy. Your post mentions a common problem. When I was overses, it took me several days to figure out that one of the reasons I felt so at peace was because I wasn’t looking at advertising! There wasn’t any. I love vintage items and like you often find them at great prices. To keep from hoarding, one of the habits I have put into practice is the following: I have a chosen storage place for my vintage linen collection. I’m free to collect to my heart’s desire as long as it fits in that space. Once it overflows, a previous piece has to be passed on, or I need to pass on the great buy. This has really helped me become more picky with my collection and not feel the need to purchase just anything because it’s a great vintage buy. That is a really powerful way to think about it. It really hits home for me. Trudy at Hotpatterns has a Youtube instructional video about how to make vintage scarves into cute tops. It might be an alternative to your current dilemma. I understand the impulse towards consuming and owning fewer things, and generally agree with being mindful about what we buy and how much pleasure it gives us. I’m not sure I understand why people might feel guilty for owning a collection of scarves, or a certain number of items of clothing, whether it be 100, or 50, or whatever. When does it become a problem? I say when a collecting practice impedes your life goals, including financial goals. For me, it’s really difficult to tell when I’m collecting things for the sake of collection, or using them as a substitute for something else. Perhaps that’s not the case for my scarves because I do love and use them. But I just have this uncertainty about hoarding stuff, I suppose. Because I *have* collected stuff out of anxiety or boredom, that feeling of unease sort of spills over, if that makes sense. I always used to worry about throwing things away, in case I regretted in later, but a few years ago I cleared things out and feel so much better for it. I guess part of it is that being a student/ graduate involves probably moving house at least every year (I have done for the past 5 years and anticipate this continuing for at least a couple more) so wanting to feel that you aren’t weighed down by material goods becomes quite a literal thing! I used to feel guilty about my collections and how much space and consumerism the represented. Yarn and fabric I had an easier time dealing with; they are the materials of my craft and not only do they make up my hobby (and occasionally supplementary income) but they result in useful objects and clothing. The closet, however, was harder for me to justify until I decided that dressing up is as much of a hobby and an enjoyment for me as sewing and knitting are. Yes, I can always downsize (I typically make a donation run at the end of every season. Share and share alike!) and, yes, I have tried to become more picky about what I purchase. In the end however, I feel that there there are worse things that I could spend my time and money on. This has really hit home to me in the last six months. I am an avid vintage seeker. I *love* thrifting, estate sale-ing, and finding lost vintage treasures. These past few years I’ve learned to walk away from deals, even if I adore them, to leave for others to be excited and find. I have found that the thrill for me is often just the just getting out and finding things, not so much the having them myself. This year my challenge is to simplify and get rid of LOTS of stuff. I come from a long line of collectors (aka packrats) and so does my husband, and we’ve both been interested in our vintage for most of our lives, but we’re finding we don’t enjoy our “collections” as much as we used to and we can’t enjoy the things we *do* have that we adore. So our goal is to simplify and pass on “treasures” to new homes, so we will more able to enjoy our most cherished things. When it comes down to it we know what is most important, and our “collections” are not that. It’s having each other that counts most. When I expressed my horror at the idea of there being 100 “essential” items to own, my concern was about the idea of 100 distinct categories of items, rather than 100 pieces of clothing in total. In terms of that book, your scarves only count as one thing! I think we absolutely do have an inbuilt tendency to hoard things, store them up, accumulate to keep us going in times of scarcity. Like squirrels. And as you say, we apply that tendency to clothing and other material possessions where it makes no sense. We can work against that, but it’s not as simple as just being bossy or strict with ourselves – it’s deeper work than that. Have you seen a book by Tim Kasser called ‘The High Price of Materialism’? It’s not too long, not too academic, and a very interesting read, all about the psychology of modern consumerism and materialism. Thanks for the book recommendation Nina, I added it to my reading list. I have been loving these posts and discussions! I’ve just finished the book The Joy of Less, which has helped me take a conceptual/philosophical approach to slimming down my worldly goods, which I accumulated emotionally. What I like is that there’s no rules (only 100 items or “only what you need”) but trying to get to the heart of what’s useful and inspiring (because we need that, too!) and why. One of the things she says, which I’d like to do in my own closet soon, is to take everything out. In your case, your beautiful scarf collection. Try to look at it with new eyes and pick out the ones that you absolutely love and put those back in. It’s like curating a current collection from what you already own. Everything else can be either packed away, to be reviewed again later if they’re missed or, my favorite: Passed on to someone who will love them. I love seeing a friend wearing something I loved — I still get to enjoy the object by having it in my vicinity and my friend does too! Anyway, all a way of saying, yes it’s hard. And you’ve got such great style we all admire, and I really appreciate these posts. I think how much is too much is entirely personal. Lately I’ve been finding that more than four of anything and I get overwhelmed — four warm-weather scarves, four basic skirts, four sundresses, etc. It doesn’t mean I only own four of those things but that I rotate my closet, pack things away, etc. Then I have less in my active wardrobe, easier to choose and get dressed. Refresh as needed. Actually that’s a discussion I’d love to see here on Coletterie — do people rotate their closets? How and why? Seasonally? To explore living with less? Another great-sounding book recommendation, thank you! I added this one to my reading list as well. I think that would be a great topic for discussion. I’ll try to bring up the topic soon! It seems to me it’s only a problem if it keeps you from doing other things: you spend so much time shopping you don’t have time for your family, or you spend so much money you can’t afford food or something like that. I think it’s unfair to feel excessive simply because other people have less. That’s true. I do know that there have been times when I *have* spent too much time shopping, or even just window shopping. The internet has made it so much easier to while away hours just looking at pretty things. I actually had to curtail my time spent exploring Etsy a while back. It seems harmless at times, but when you realize you’ve spent hours sitting on the couch zoning out looking for a perfect pencil skirt or whatever… ack. That’s a problem for me, even if I’m not actually buying a lot. You’ve crossed a line when your accumulation/spending starts to threaten your well-being or someone eles’s wellbeing. I’m thinking of the show “Hoarders”, for example, or people who have chronic debt from shopping. Until then, it’s pretty harmless. The world is made of material things. There is nothing wrong with reveling in its beauty. Limit yourself to buying things that are really useful, or things that you really love, and you’ll probably be fine. It’s interesting that you bring up “hoarders.” I have a theory that part of the reason that show is so popular is that people can recognize a piece of themselves in it, except taken to the nth degree. Oh, yeah, definitely! I feel like I have a deep connection to objects — they provoke memories and feelings and all kinds of reaction in me. So it’s instructive to watch a show that shows what happens when your relationship to objects gets out of control. I certainly have more than 100 items of clothing! Especially if you lump the seasons together. I’m constantly culling but still find that there are items that I just love and, frankly, everything I own I do wear at least a couple times each season. For me, my solution has been to permit myself certain “exception” types of garments. Skirts and sweaters are my favorite things to wear and make, so I don’t restrict myself on the volume and variety of what I own. But that means I force myself to be very choosy about the blouses, dresses, pants, scarves, shoes that I let into my life. They have to be something I love or are versatile (i.e. clothing that will get worn a lot!) for me to keep it or buy it. At least that’s my latest solution. I find that if I restrict myself too much in clothing, it takes the fun out of it — and since it’s a form of artistic expression for me, I don’t want this to not be fun! I don’t like feeling guilty over what I own or bored with too many limitations. Not sure what I will find as the best balance since our choices and mindsets have repercussions not just for the lives we lead, but for the lives of everyone who lives on this planet, but an attitude of healthy consciousness is always a good start! So what I’m doing instead is a focus on weeding out the things that just aren’t working for me anymore, either through donation or refashioning, so I’ll love everything I have to wear. I’m also trying to work through my rather ridiculous stash of fabric, while at the same time thrifting with more of a focus of filling holes in my wardrobe so things I own already become more versatile. And as long as I can figure out ways to store things, I’m not sweating accessories accumulation. I also enjoy making jewelry, and so while I probably don’t NEED as many beaded necklaces and earrings as I have, I like them, I wear them, so I’m not going to worry about paring them down. So that’s my vote for your scarf collection–use and enjoy, guilt-free! In response to the 100 list, I do think that number is high for a list of *essentials* or staple pieces. I like to have a small, streamlined collection of versatile, classic garments that can easily be updated and worn in different ways with the help of accessories and more interesting pieces, but the contents of my closet *far* exceeds 100 pieces in total! Especially if we are counting accessories and jewelry. 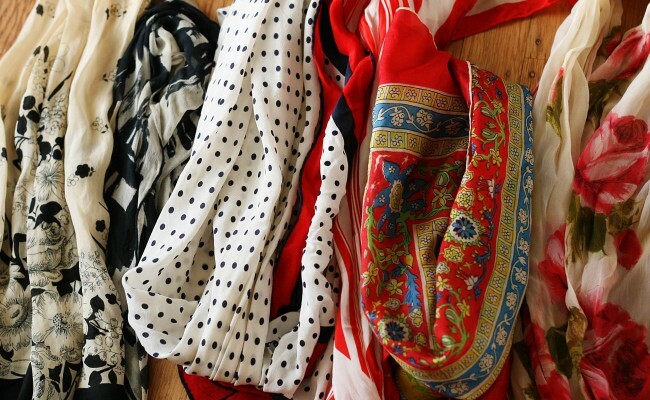 Your scarf collection is so pretty and you should definitely not feel ashamed about collecting them! While I agree that 100 items is a bit high for an “essentials list,” I have to say this: I own approximately 56 scarves… I also own about 25 sets of bangles from India. The great thing about a very small essential wardrobe of basic pieces is that it allows you to indulge in pretty/funky/unique things like scarves, shoes, belts, jewelry, etc. There’s a reason the little black dress is classic and versatile–ANYTHING and (nearly) EVERYTHING goes with it. Personally, I’d rather have an “essentials” list comprised of 10 interchangeable items of clothing of GOOD QUALITY with a ridiculous amount of accouterments to change up the looks vs. 85 things, 75 of which will only get one-time use. Some call it accumulating, some call it collecting. I prefer the latter. I get the anti-consumption idea– so many have so little and not by choice. However, I love to collect beautiful things and generally don’t feel guilty about it. I recently came across a home dec post encouraging people to live simply and sell/give away their “excess” stuff, even books. I have a ton of books, many of which I won’t read again. Then I came across another thought, of collections as autobiography. I think that’s a lovely idea, reading your personal story through your collections. It may be navel gazing, but at least it’s done beautifully. In the end, I think it comes down to guilt. Alongside the rampant commercialism of our society, we are also told ‘money can’t buy happiness’, and ‘less is more’. We end up wanting more and more belongings, and then feeling bad about how much stuff we own. Personally, I don’t believe in guilt. If you are going to feel bad about something later, don’t do it in the first place; once something has happened, feeling guilty is pointless because you can’t change the past. And money may not be buy happiness, but it can make life much less stressful, and that dinner out with your partner might just make your whole week. And I’m sorry, but more is often highly enjoyable. I think it’s time we stop letting a love of pretty things make us feel bad about ourselves. If it’s creating problems with your loved ones or driving you to bankruptcy, then you have a problem, but until then, seriously, stop worrying. Make a charitable donation instead of this pointless first world guilt; and then go buy yourself that vintage necklace. The smile you get every time you wear it might just brighten someone’s day. I see your point, but I can’t really say I agree. I’ve heard a lot of people say they don’t believe in guilt or regret. But if you’re looking closely at your decisions and trying to be objective, it seems like those are natural reactions to recognizing what might be a mistake, and the first step to correcting future similar ones. Buying a vintage necklace isn’t really the problem for me. Spending a bunch of time online browsing shops and not paying attention to the world around me has been more of one. As Hana said above, finding yourself putting “stuff” ahead of people. I DO strongly agree with what you’re saying about conflicting messages though… on the one hand, we’re told to buy more, on the other that we should live simply. It reminds me of the way junk food and diets are sold to us, at least here in the US. Every person decided for oneself how much is too much and where is the limit. But unfortunately we’ve been so much conditioned by the media pushing us to consume that it becomes very hard to detach from it. At the end, we are all social animals. Imagine for one moment that the society we live in promotes different values and Nina Garcia publishes her book about how bad is it to have 100 essentials? I am sure our behavior would change. Phooey. I don’t see why you should feel any guilt or anything negative at all. Feel guilty if you stole them, or if you borrowed and never gave back, or if you didn’t have money to feed your family cos of your spending habit! So long as it is not shopping for the high, which can happen to all of us, which leads to unnecessary and unloved things, I don’t believe there’s anything wrong with having loads of stuff – so long as it’s not on a hoarder level or an addiction level! Personally, I have soooo much stuff. I have sisters who are much older than me, and have inherited stuff from them which doesn’t fit them anymore – am very happy with a vintage long leopard (fake, natch!) coat I just inherited! Then I have stuff I inherited from mummy. A cousin who regularly gives me stuff she gets bored of or grows out of to recycle or remake. etc etc…. At least twice a year, when I do the seasonal changeover, I fill bags to give the SPCA for their shop and jumble sales. Things I have realised I don’t love or which don’t love me but are still good. But I keep a lot of stuff – because I know that just because winter wasn’t very cold for the last couple of years, and I didn’t wear my down coat and fake furs, it doesn’t mean I won’t in the future – and lo and behold, this winter the temps reached record lows in my island! I have shoes I bought 25 years ago in Rome which are still in great shape, as I look after my stuff – I have shoes that are out to dinner in a car type heels that are ancient and beautiful – I have shoes that were my mother’s – what, I should throw out old Chanels which are still great because i have too many shoes?! I have a tshirt I bought from Maxmara which cost a stupid amount but was the most perfectly made striped long sleeved top I ever saw which is now 22 years old and still great – so, i should throw it out? What I am trying to say is, don’t feel bad because you have loads of scarves or whatever it is – I don’t think that as someone said, you should choose only those you really really love and chuck the rest out – hello! you like them all, you wear them all,they are fab accessories to help create your style – if you like them all, keep them all. but if they’re unwearable, use them to make a pincushion or something :). I have a lot of scarves and shawls and quite a few sets of beads, but they allow me to have a fairly small wardrobe of clothes as I can make lots of outfits with quite different looks by changing my accessories. So I find it quite practical to have a collection like yours. As another collector, I can understand your stepping back to look at this from another perspective, especially after some of the comments you mention. Like Casey, we recently moved, and pared down quite a bit—giving things away to family, friends, the neighbors we were leaving behind (*sniff*) and to local charities. I was embarrassed to find a bunch of dress pants—I only wear skirts and haven’t worn pants in nearly a decade!—in an underbed bin. :( Someone else could have (and is now, though) been using them! But even after all that paring down, I felt like we still had a *ton* of stuff. That said, I look at many of the things we have and so many of them—most of them—remind me of the past, of the people who gave them to me. Obviously we’ll always have memories, but as someone with health issues that have really decimated my mental capacity compared to what it used to be, my memory isn’t as great as it used to be. But looking at, for instance, my great-grandmother’s mixing bowls, even the ugly one (which I use regularly—they are a treasure to me), the vintage teapot a neighbor gave me—they trigger memories I might otherwise lose forever. They speak to me and aid me in remembering when I might otherwise be lost. Also, I wonder if many of us simply don’t want to waste things, especially these days! If an item can’t be given away because of poor condition, like the threadbare scarf you mentioned, I think we feel guilty that we are “not getting our money’s worth” or even worse, that we are just pitching it. When I find myself in that situation, I try to find another way to use the item if it can’t be given away. Old t-shirts and cotton PJs are cut into rectangles I can use to wipe down my counters (much more colourfully than with paper towels, too! ), for instance. It doesn’t feel so bad if an item is getting additional use. Maybe you could use that scarf as purse lining, or use the edges to add ruffle trim to cafe curtains? Ultimately, though, if you love something and enjoy collecting and using it, I don’t think that you should feel terribly or even guilty about having a great deal of it. Would you like to see my library?! ;) So long as you’re not going into bankruptcy over it, alienating family and friends, or obsessing about the things that give you joy and delight…please don’t feel badly about it. Everyone is different, with different priorities in life. If that weren’t the case, how bland this life would be! Lol Jen, we were posting at the same time – I too briefly mentioned memory in my post, but didn’t expand on it much, but am glad you did! There’s no need to justify your ‘use’ of objects as holders of memories. None of us can keep them all in our head all the time, we all need triggers. And the older we get, the more memories we accummulate, thus the more help we need to trigger them. I’m really glad you brought up the subject of memory. I have a great deal of trouble getting rid of anything with any type of personal meaning or memory attached to it. Sometimes this is an important factor, like you say. Other times, I feel I’m just… holding onto something that’s gone. Or don’t want to admit that the meaning isn’t there any more. I have found taking a picture of the object, to hold the memory without keeping the object itself, is very helpful. Especially for clothing that no longer fits, is out of style, etc, and thus very hard to justify keeping. But I have 75 dress scarves and probably 35 work skirts and I’d like to have about 20 work dresses, and in general I’m with Francesca. Stuff isn’t a problem until it gets in the way. Noticeable bright colors and patterns require a larger rotation than black pants that can be inconspicuously worn every week—but wearing boring black all the time would be unhealthier for me than having too many clothes. I may return with a longer rant about that. Oh lordy! I could talk and talk and talk about this sort of thing all day. My apologies in advance for what will doubtlessly be a very long post. I’m in comps. year of a PhD studying history of dress and material culture – from a primarily social history perspective. One of the big watersheds in this field occurred c. 1980 when academic historians started turning their attention towards consumption (rather than focus purely on production, as had been the norm). Since then there has been A LOT of really fascinating and thought-provoking scholarship done on both material culture and consumption. One of my comps is on theory and practice in material culture, for which I’m doing the mountain of reading right now – and a lot of it relates to consumption (which is not just the acquisition of goods, but also how they function in people’s lives, are used, discarded, recylced and – I love this – not only reflect culture but also contribute to its creation). One of the things I love so much about my area of study is how personal and relatable it is. Reading research into material culture and consumption behaviours/motivations (which are not one and the same), past and present, really makes you think about your own relationship to objects of all kinds. I’ve been performing so much self-analysis since I started seriously studying in this field I can’t tell you. It’s caused me to confront some assumptions I’d held and led me to make really conscious decisions about how I want my life to be – in which objects are ubiquitously implicated amongst all human beings regardless of culture or personal beliefs (food counts as material culture). The result, for me personally, is a desire to be increasingly selective about the objects I bring into my life. To emphasize quality over quantity, and avoid superfluousness. I too like pretty things. In addition to fabric (my substance abuse problem) I also love tea paraphernalia: pretty china tea cups and saucers, little silver spoons, teapots, I bought an antique tea cart in the last year, I taught myself how to make those lovely tiered dessert plates using vintage finds, pretty linens, etc. not to mention a wide variety of loose-leaf teas. However, I don’t want to live in a cluttered space. So I try to limit my acquisitions to items that really resonate with me in some identifiable way. It helps too that I had to do a massive purge several years ago when I made a cross-country move to go back to school (for my MA) in which I gave up at least 2/3 of my worldly possessions. It really helped me identify those things I cherished most. Since then I’ve tried to be more selective (to greater and lesser degrees of success) about what I add, and find it easier to remove things that are of little use or value to me after all. I have no problem with things, I love things. They can be immeasurably important and valuable as repositories of meanings and memories that we can’t hold in our heads all the time – this often seems to be especially true for clothing items because of their intimate proximity to and interaction with the human body, they can act as ‘stand-ins’ for the person. I’m also very gratified to see that so many people posting on here also recognize the potential values of ‘things’ (within certain boundaries) – contrary to some still-pervasive views within academia. Your field sounds absolutely fascinating, Carolyn. Your last statement, about the resonance of clothing, really holds true for me. I don’t have the world’s greatest memory (and it seems to be getting worse), but for some reason I can almost always remember what I was wearing at a given time and place. It’s a really important part of memory recall for me. I think this is one reason I care about clothes so much, and perhaps part of why sewing has meant a lot in my life. Carolyn, so interesting. I would love to read your thesis when it is published. I do get occasional bouts of wanting to have nothing much so I could pack up and go super easily – but they are very far and few between. your post made me realise that a lot of the things I have are actually memory depositories – things that belonged to my mother, especially. Scarves only count as one thing, no matter how many you have, at least in my opinion. But more seriously, if you use them and they give you joy (which is useful) then you don’t have an excess. If you feel really badly about how many you have hanging around, of course, I could help you out. I’ll come over and take away any you don’t want to keep, lol. It’s not the thoughtful collection of things you love that’s the problem, it’s the collecting of items you think will make you happy by filling a hole in your life, or the thoughtless accumulation of items that are meaningless, just because they are cheap. I don’t honestly know how many items/articles I have. I do know, however, that when I worked at a clothing store, it was really easy to say “oh, that’s so cute!” and somehow convince myself that its worth buying, since I had a 50% discount. Some of the pieces I bought I still use, some I’ve had to put away while pregnant and hope to still use, and some have already gone to charity. I have a few scarves, but they’re all big ones. I need to find a place that sells smaller silk scarves, I think those would suit me better than the pashmina-style ones I have now. And related to all of this, its not that hard to resist spending money when you don’t have much to spend in the first place… at least for me. What a great post, and a great discussion! I agree with the commentators who have said that as long as one is happy, there’s no reason to feel guilty. I started re-thinking my wardrobe because it was making life too complicated – it really was as simple as that. If it ain’t broke, there’s no need to fix it! As for the 100-piece wardrobe… I personally don’t think that’s excessive at all – I wouldn’t be surprised if mine was 1,000. If 100 works for some, that’s fine, but it might not work for others. I also recognize that there are probably people who can control a 1,000-piece wardrobe without any trouble – I’m just not one of them! I don’t think we can claim a universal truth on something like an amount of clothing. What’s more important is discussing the reasons why we have bought things we don’t need, why we feel the need to downgrade, why simplifying our lives makes sense, how to be happy, etc. I totally agree with you! The fact that we don’t need all those mountains of things, but we are so much assaulted by advertisements on TV, on radio, on newspaper, magazines, even in our mail and e-mail, it’s everywhere! So i think even with the best will to not fall on the trap it is very difficult and tiring, a non stop fight to push away those solicitations. But maybe with self discipline and a lot of good questioning “is what i need? Is i haven’t got something similar? What are my priorities (in shopping or in more global plan) ? Maybe considering some values, general or more in details can help changing the way and also the why we consume like we did. But i also have a big difficulties to clear off the “too much” accumulated, it can be paper that i keep to reuse or plastic bag! Crazy, but i found out an huge amount of plastic bag lately after a year of “collecting” i put them somewhere i can see them and so reuse them as garbage bag, instead of buying special garbage plastic bags. Also i will do my best to refuse bags when i buy something, i’m already doing it for small objects or whatever, but i rarely do for bigger things like when you buy boots the package is huge! So i changed the regular sized plastic bag i put on my handbag for slightly larger ones to prevent collecting others one! I’m totally off topic but it’s what i found i was accidentally collecting! Otherwise i really try to not buy fancy stuff i don’t need or that will not much stick with what I’m really used to. Ugh i write long! I’ve read on a couple of occasions that most people only actually wear about 20%-35% of the clothes that they have hanging in their closets. I clear my closet of things I haven’t worn in a couple seasons and I still seem to wear the same few favorites for the season, leaving about another 2/3 of my closet with things I wear only now and then but are special for some reason. I have jewelry that I rarely wear but do wear on occasion so I keep it. I have some jewelry that I have not worn for a long time but came to me as gifts from loved ones. I keep them. I tell myself I’ll pass them on like the collection I have from two of my grandmothers! I sometimes feel like I’m holding on to too much stuff. I think I’d feel better if like Sarai I was at least wearing these things. Sometimes our belongings represent aspects of ourselves and the connections that we have with others that we find very hard to relinquish. this is an issue that i’ve been struggling with for awhile. 100 pieces seems like A LOT, but when you get into your wardrobe and start counting, it doesn’t seem like that much at all, especially if you have a fashion-related collection or if you make things to wear. i think collecting scarves is fine as long as you aren’t also collecting shoes, bags, jewelry, hats, and pencil skirts. adding to and playing with your collection can be a lot of fun and can be a bright spot in your day. it’s also fun to be known for always wearing a fabulous scarf or equivalent. however, if you only add to your scarf collection when you’re feeling down, you might be collecting memories of bad experiences. i try not to shop when i’m having a bad day, because i find that my purchases from those days get “tainted” by the bad mood, and then i just don’t want to wear or use them, even if i know it’s something i would normally like. it sounds like your scarf collection is all positive and no negative, so i say enjoy them! There is nothing like having to empty a family member’s home to make you realize that it is up to you to choose the objects that are special in your life. It also taught me that I don’t want anyone to have to clean up after me, so now it is definitely easier to donate and recycle, and not acquire new things without thought. The things I choose to keep have more value to me. It doesn’t always work, I also have a box in the attic with all my siblings report cards; I couldn’t be responsible for throwing them away. I think focusing on having too much, or too minimal is actually the issue; when I obsess about organizing my closet, I start to stress — too many tops? Not enough camis? I think we are within our limits to enjoy the material pleasures of life, and when we stress or obsess in either direction, we perhaps sap some of the joy of consumming. I enjoy a dessert now and then — but if I felt guilty and obsessed every time I ate dessert, the pleasure is minimized. It is good to question and discuss these issues, but overthinking can be the enemy, especially if we can gage our personal limits anyway. Just wanted to chime in… I think that as long as it bothers you it needs to be addressed, but there are a lot of different ways to live simply. Someone who owns 20 scarves might indeed live more simply than someone who is constantly obsessing over making sure they don’t have too many things. I am trying myself to focus on deprioritizing the urge to acquire stuff (which I certainly feel strongly, it’s pretty ingrained in North American culture) while at this same time avoiding feeling like there is some arbitrary standard of *True Simplicity* that I am aspiring to. Lots of comments about not feeling guilty about consumption unless it begins to be harmful – like taking time and money away from family, getting into debt etc. I am a bit surprised there are few comments on consumption that is harmful to others or the environment. Evidently buying from thrift stores has minimal impact – except that when you have too much stuff, you have to buy a home with enough storage space, and you pay to heat and maintain it. Buying new of course involves choices that do impact the countries where the clothes are made. I’m not saying that means we never buy new clothes – but if we are working out whether actions are good or harmful, it’s not just their impact on US and those close to us that matter, but on people we’ll never meet, too. And I love your scarves and have absolutely no issues with you owning them! Okay, I have at least 40 scarves and ugh, 40 purses. Why? My mum gifts them to me and they are a non-sized item. Maybe just the Hermes and the Venetian silk scarves are nice enough to save for a descendent but there’ll be a lot of winters between now and my death. Now jeans- I might have 4 pairs, but 40 pairs would be ridiculous regardless of if ever changed size. Scarves are little and can accessorize a plain outfit. Long live scarves. I am a minimalist for sure and purge more than I should. I don’t know if you can have too many of something you love plus scarves don’t take up much space….that’s a good thing. If I collect anything beside fabric it’d be … Okay… Nothing. I tried to think of something, but I guess there isn’t anything that two or three of isn’t enough. Once again, your post has put into words the thoughts that have been mulling around in my mind. I love to collect; to find useful, pretty and interesting things at the thrift store, but I’ve often wondered where the line is drawn between collecting and hoarding. I always feel so proud when I leave the thrift store with a bag full of pretty things, and I usually justify my purchase with the fact that they are ‘inexpensive and second hand.’ For some reason I thought these two qualifications excused me from being materialistic. But as you said, inexpensive is not the point. I will surely be more mindful in my shopping from here on out. if 100 items is excessive, I must be a tv-worthy hoarder! I have just over 100 dresses alone, 75 hats, a cardigan in every color there is, etc. I recently purged my closet of things that I don’t love so I do wear everything I own. Its hard for me to part with fashion items because I remember the day that I found those things. I only buy vintage or modern thrifted so it takes a lot of digging and thought before I purchase something. Every time I see it, I remember the fun I had that day at the estate sale with my best friend or how much I adored the color or print of the fabric. Fashion history is my passion and owning and wearing vintage is bringing that time in history back to life. Many of my pieces were bought because they needed repairs that no one else was willing to do so the time and care I put into reviving these things also makes me happy every time I wear them. Some people feel ashamed but not me! Everyone has their pleasures in life and fashion is mine. I have a strict rule of no more than $50 per month on clothes and accessories and when I finally do get rid of something, it is usually donated.